Dogs scratch themselves all over the place the same way humans do. Ordinarily, it's not a problem, but if the scratching seems to focus heavily on the ears, there's a good chance something is wrong. The same applies if you notice that where the ear skin is ordinarily soft and leathery, it's dry and cracking. When this happens, it's essential to get to the root of the problem so you can fix it as soon as possible. There are many reasons your dog's ears could be excessively dry, but allergies, poor diet, fleas, and yeast infections are the four most common problems you can fix at home according to Natural Dog Company. If you notice the problem is seasonal or only occurred after you changed her food, the issue might be allergies. When dogs don't get enough nutrients, this can also cause dry, itchy ears, so if their food lacks omega-3 fatty acids or is high in fillers like soy, corn, wheat, or other grains, you may need to switch foods. It should be obvious if your dog has fleas as you might notice the insects themselves, see your dog excessively scratching, or you might even get bit. Yeast infections in dog ears is a little harder to notice than the other common culprits for dry ears. The inner folds of a dog's ear are very moist and dark, making them the perfect place for yeast to flourish. 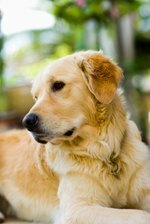 If you notice the dog is always scratching at his ears, it might be due to a yeast infection. Also, if the ear smells bad, it could be a sign of infection. Constant scratching of a dry ear can end up resulting in dryness and scaly bald patches, which are easy to notice, but only appear long after the yeast became a problem. You don't want to overwash your dog as it can dry out his fur. But if your dog has notably dry ears and you haven't been bathing too often, you might try washing him a few times a week with a medicated shampoo designed for dry skin. These baths provide an opportunity to look for any parasites that may have moved into your pup's ears. It's important not to get water inside the ear canal though, which might make things worse, so Animals Guru recommends using cotton balls in the ears during the bath and then cleaning the inside of the ear with a blend of equal parts water, rubbing alcohol, and vinegar. After the bath, apply a soothing balm to the ears. Many products are commercially available to treat irritated dog skin but look for one that has antibacterial, anti-fungal, and anti-inflammatory properties as this can relieve the symptoms and help stop the underlying problem. If your dog's food has a lot of fillers and not enough meats, it may be drying out her skin. She might also have an allergy to the food resulting in scaly patches. The only way to discover an allergy is to keep eliminating potential allergens until the problem has gone away. If you're sure her diet is high quality, but she still has dry ears, then you might consider giving her an omega-3 supplement like fish or krill oil. If these simple home remedies don't help the problem in a few weeks, or if it gets worse, be sure to head to the vet. Your veterinarian may be able to uncover underlying health issues that could be causing issues, such as an infection, mites, skin condition, or another issue. The vet will likely ask you about your dog's diet, lifestyle, and any allergies he may have, and she may take a culture of your pup's ears. Apply moisturizer to the affected area.